Today I have a slightly different post for you all. I hope you read to the end and enjoy what you see. A few years back I was in a luxurious position where I finished work at 4pm every day and could indulge myself in my evenings. One of the things I tried was a course called “‘Develop’ Pattern Drafting” at Leeds Art College. This was just after I tried the print making course and was fully enamoured with the LAC’s facilities. Over the 10 weeks I made two blocks and about 6 patterns. I then promptly shoved them on a shelf and forgot about them… until a few months ago. I saw an email saying that LAC would sadly have to stop its evening education programmes and it inspired me to dig out my designs. The pleated tuck effect of my pattern is created 90% by dart manipulation and 10% creative construction. I should caveat this by saying that my construction method may not be the most logical way to make this dress. But who cares, because this was my experimentation time and it’s not like I’m forcing you to copy me. Plus there’s a guarrantee I won’t remember the process entirely accurately but let’s cross our fingers shall we? First things first I drafted a V neck bodice with waist-only darts and slim straps and importantly NO SEAM ALLOWANCE. I traced off two copies of this bodice. On the first copy I altered to swoop of the neckline so it fell under the bust (about 1″ below the bust point), leaving a shorter side seam no dart. This became the left side as worn. For the right side as worn, I repeated the above neckline swoop but made the width of the front stop about 1.5cm into my dart area so it would be caught inside the closed dart. I then slashed three lines that angled from the new shorter side seam, connecting to the bust point. By slashing up the dart to the bust point I could pivot the paper so it opened up gaps between each slash, creating my pleats. This was really fiddly, I’m not going to lie. Keeping the neckline edge on the correct curve so it met the centre front evenly and only opening the pleats below that point took some practice. Then I added seam allowance all over! As I knew I would finish everything with bias tape facings and an overlocker I use small seam allowance. On my toile I had some slight pulling due to the positioning of my neckline curve so redrafted slightly to fit better under the bust. To construct the dress I had to sew the shoulder seams, bind the neckline edges stopping short of the back zipper area, construct the pleats, sew the pleats into the left dart and sew the remaining right dart, tack the lower edges, sew the side seams, add the circle skirt, install the zip, finish the neckline binding, bind the armholes and bind the hem. Plus overlock the waist and side seams at strategic moments. You might notice I also changed the colour of my topstitching from the in progress shot above! I wore this dress to a friend’s wedding and felt very glam all day. The fabric used is a silky poly sateen from Minerva Crafts. It’s very drapey with no stretch, so don’t imagine cotton sateen which is more crisp. It was £16.99 so quite a splurge on my part when I didn’t have any specific plans but I couldn’t resist. It’s a hand-painted digital print, with splatters of paint and brush marks visible in the design. The colours are so gorgeous and there are places where it reminds me of a milky way or galaxy. My only regret is not buying half a metre more. I let fear of how much I was spending get the better of me and ended up with a pattern placement I’m not 100% happy with. Although it still looks great, it gave me a lot of headaches trying to place the print in an attractive way to show off the pleats. While pattern drafting at home is rather involved unless you have lots of space and a good head for maths, dart manipulation at home is lots of fun. I highly recommend taking a basic bodice pattern you know fits you and play around with pivoting the darts. You’ll just need some basic supplies like tracing paper, or dot and cross paper with a tracing wheel and carbon (don’t use the hemline carbon it’s crap). William Gee have some great prices on drafting papers even if you just want them for tracing off your patterns. Perhaps you’re ready to try pattern drafting? Well a pattern master will be your best friend for 90 degree angles, quick measurements and soft curves. And I must confess I live by the bible of Winnie Aldrich but some people seem to hate her method. On the course we followed Hilary Campell but I couldn’t retrain my brain to Hilary’s ways. Maybe it’s just what you encounter first? I hope you found this post interesting. It was a bit more in-depth than many of my other posts but perhaps it’s inspired you to have a go at pattern drafting if you’ve never tried it, or dust off the old pattern master if you’ve left it alone for too long. Gosh it’s been ages since I last posted. I get this horrible feeling when I don’t post during a week. Let’s remedy that! I’ve been sewing like a maniac lately and have a big queue of things to show you in the next few weeks. I’ll start by sharing a few things today. First up are a couple of work tops that are modest and smart but still a bit fun and go with jeans. It’s the “I’m so cute, don’t you want to let me standardise your product and put it in a media neutral content management system” look. Snappy eh? 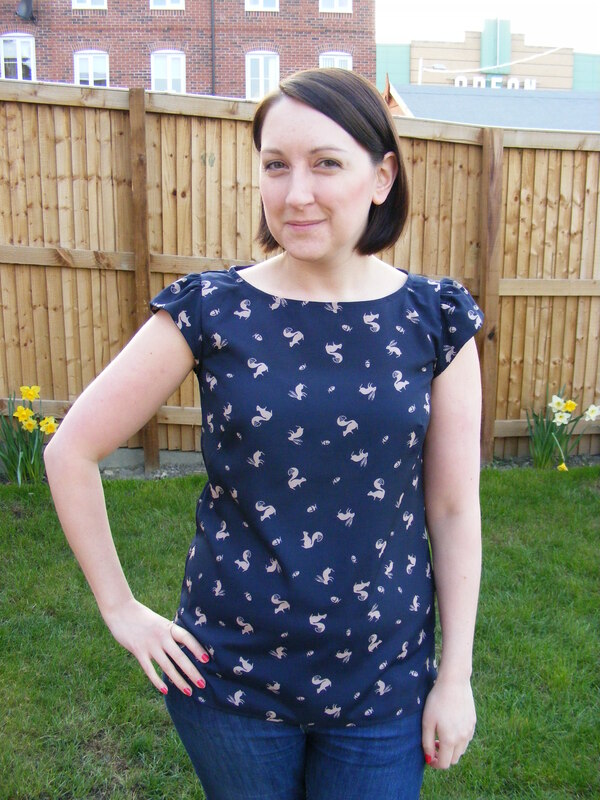 So here we have a yoke-less new look 6148 in ex-Dorothy Perkins crepe with awesome squirrel and rabbit print. I picked this up from Goldhawk Road a couple of summers ago and as soon as I was on the train home regretted only buy 1m. 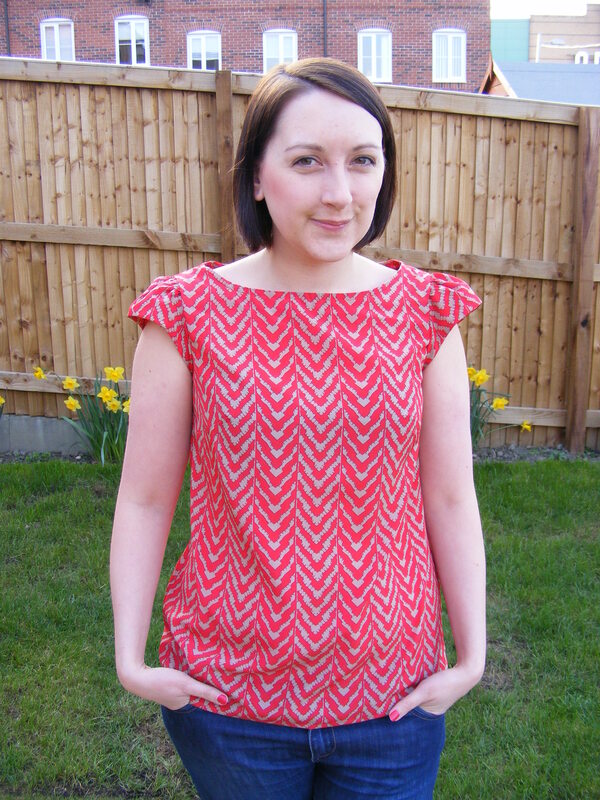 And my firm favourite, new look 6808 in red and cream polyester. I’m not falling into the trap of calling it tribal, ohhhhhh no. This fabric was one of my bargain Birmingham Rag Market purchases that I recently shared on Instagram. I thought I try the 6808 sleeves on the 6148 as well and wahey they fit all right! Maybe even a bit better than they fit the pattern they came with!? Moving along… a few weeks ago my friends had the fright of their lives. Their baby who hadn’t quite finished cooking, arrived 8 weeks early weighing in at a teeny 2 lbs. After some love and attention she’s been beefed up enough to be at home with her family. 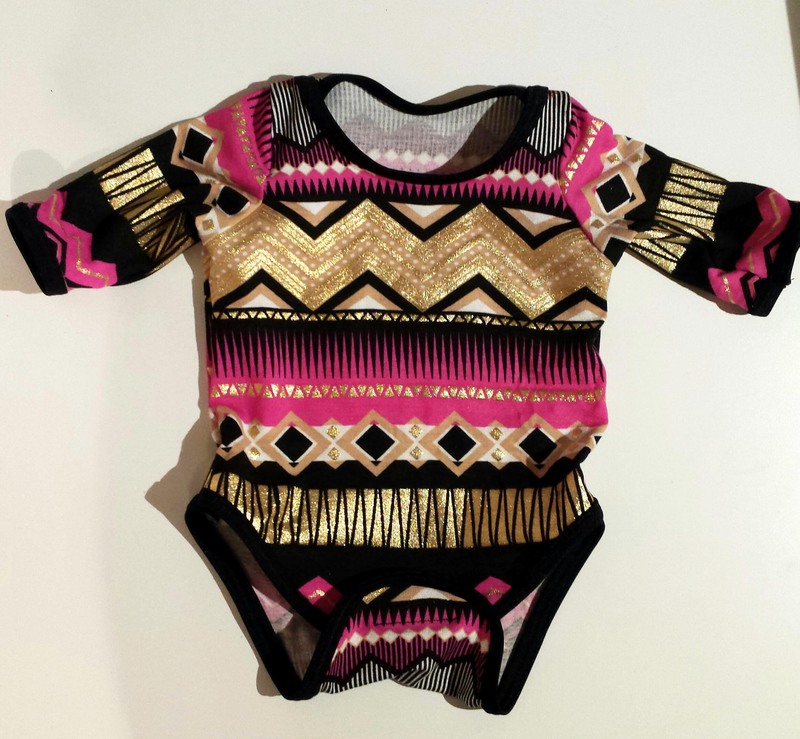 As a baby gift I made the Dylan Onsie pattern (babygrow to all us Brits) from Spit Up and Stilettos – it was free for some time but appears to now be priced. I also snaffled the Drew leggings pattern while they were free and they also seem pretty cool too for an easy baby gift. The pattern includes “preemie” size for teeny babies just like Baby Amber. I used some garish but fun hot pink and metallic gold jersey from Birmingham rag market with some jersey bias tape and a bit of velcro from Samuel Taylors, and whipped it up on my overlocker. It’s definitely opinion dividing but I knew if anyone would get a kick out of this, it would be Tom and Helen, and I love that Amber is disco-ready. Finally I made a little tool and pencil case ready for my pattern drafting class! What a geek, I know. This is the “Develop” Pattern Drafting and Garment Design evening course that I’m doing through Leeds Art College just like my Textile printing course. The notes advise bringing basic sewing supplies, plus basic pencil kit so I had to make the pouch quite big. It’s about A5 sized. 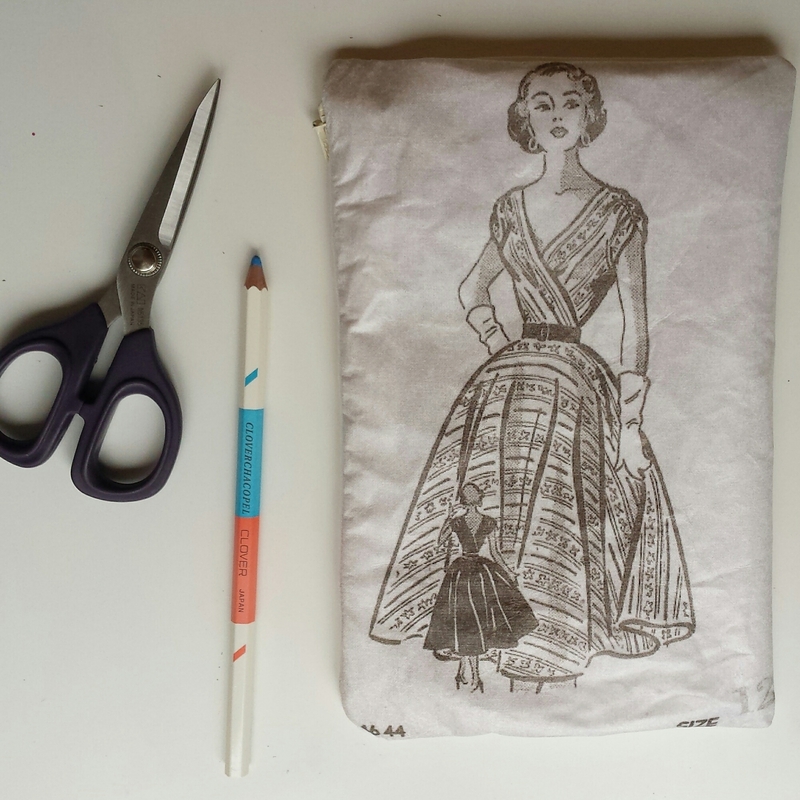 I printed a black and white image from a vintage sewing pattern onto tshirt transfer paper. I used some cotton canvas for the pouch and an invisible zipper. Here’s a good tutorial for pouches with regular zips. Easy for anyone to do, whether they’re a newbie or an old pro. Isn’t she working that dress? She’s giving me Liz Taylor vibes. Now that I’ve broken the silence, look forward to a few more posts from me soon!